Last summer at the D23 Expo Disney announced plans for a TRON-style attraction that would be added to Tomorrowland at the Magic Kingdom and would open sometime in 2021. The new attraction will be located in an entirely new area next to Space Mountain. If you weren’t already excited about this new attraction, Disney has updated us with some related adjustments to two nearby attractions,meaning construction is now getting serious. According to Disney, both the Walt Disney World Railroad and The Tomorrowland Speedway operations will be interrupted during the construction of the new TRON coaster. The Walt Disney World Railroad will temporarily take up residence at the Main Street Station starting sometime this December, pausing its grand-circle tours of Magic Kingdom. During this time, guests will be able to get an up-close look at the railroad and take advantage of one-of-a-kind photo opportunities. The Tomorrowland Speedway will also close for a portion of 2019, as the track is adjusted for the new attraction. The railroad will reopen in the summer of 2019. The new Tron attraction which will debut in time for Walt Disney World’s 50th anniversary in 2021, is based on TRON Lightcycle Power Run that is located at Shanghai Disneyland. 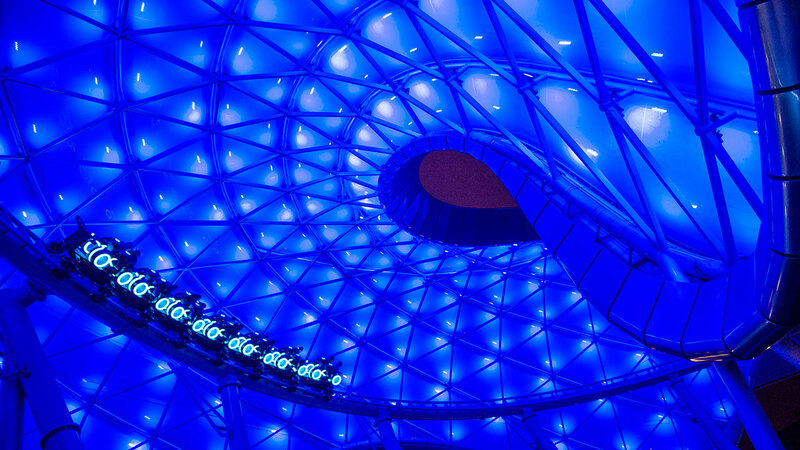 The TRON Lightcycle Power Run debuted on Shanghai Disneyland’s opening day and quickly became the highest-rated attraction at the park. I personally cannot wait for this attraction. I was excited when the announcement was made at the D23 Expo and now that construction has moved along far enough for them to start moving or adjusting portions of the nearby existing attractions I’m getting even more excited. If you were planning on being in Walt Disney World while the operations of the Speedway and the Walt Disney World Railroad will be affected please be aware of the adjusted operations.